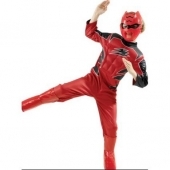 Fight the forces of evil in this deluxe Power Ranger costume. Includes injection moulded mask, and muscle chest jumpsuit. Available in children's sizes small, medium and large.